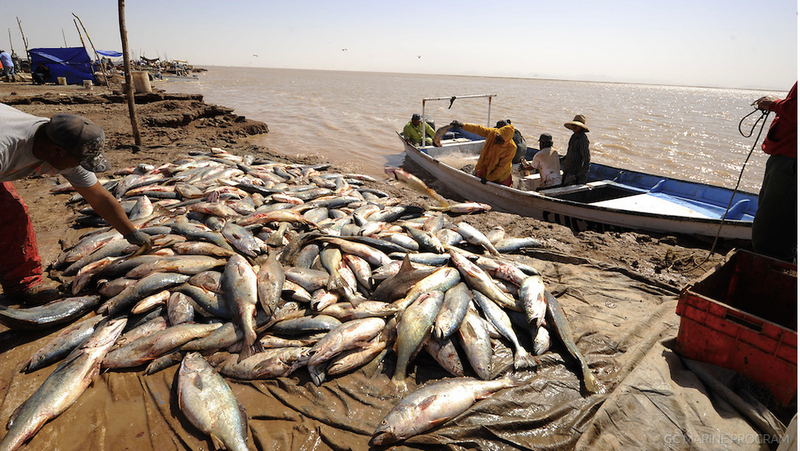 Each year, over a million Gulf corvina swim to their spawning grounds along the Colorado River Delta. These fish are famous for their loud, chattering sounds, and when corvina gather together in massive conglomerations, the noise they produce is deafening. Literally. New research shows that the sounds produced by these fish when spawning are the loudest ever recorded for a single fish—an extraordinary display of nature that’s now being turned against the species. It’s official: Gulf corvina are the loudest fish on the planet, according to new research published today in Biology Letters. Individually, these six-to-eight pound fish are noisy, but when packed together along a 16-mile strip (27 km) of the Colorado River Delta, their collective roar is nothing short of astounding—shaking the hulls of passing ships and threatening the hearing of any aquatic animal who dares to swim close. Gulf corvina are a type of “croaker” fish that can only be found in the Northern Gulf of California. Each spring, adults swim to their annual spawning areas, forming a single aggregation of several million fish. Their mating behavior can be tied to tidal and lunar cycles, making them particularly vulnerable to fishermen, who can time the fish’s arrival to the minute. What’s more, the audible cacophony produced by the male corvina leads the fishers to their exact location. During the spawning season, a single net can catch up to two tons of corvina within a matter of minutes, and an entire fishing fleet can harvest up to 5,900 tons, or 2 million corvina, in just 20 days. Needless to say, this is hugely disruptive to the species, and scientists are now worried about the corvina’s future. These decibel rates seem incredibly high (and they are), but it’s important to remember that measurements of decibels in air and water are different. As Rowell explained, the sound levels are so high because water is more efficient at transporting sound pressure than in air. So in addition to being loud, these fish transmit sounds faster and further than they would in air. That said, sound isn’t experienced differently underwater. So a single Gulf corvina, at 177 dB referenced to 1 uPA, is louder than two 175-horse-power outboard boat engines running at 55 km/hr. “So corvina are very loud,” said Rowell. “Again, for in air comparisons subtract 63 dB from 177 dB.” That’s about 114 dB, which is about as loud as a live rock concert, and just 6 dB below the human threshold for pain. As to why the fish engage in this behavior, the researchers say its an evolutionary adaptation that allows for communication between individuals in an inherently noisy environment. It’s basically like the Lombard effect, where people unconsciously raise their voices to be heard when others around them are also speaking, but for fish. There’s also some cocktail party effect involved, which allows an individual fish to hear another fish over the din. [We need to] (1) raise the market price of the corvina so the fishermen are not forced to catch so many to make a profit. This is the biggest driver of overfishing that is not the fishermen’s fault. (2) We need to improve the way we monitor the fishery, and running these acoustic surveys is the best way to estimate the population. (3) As fishermen have been suggesting for many years, if we can simply close the fishery during the peak spawning day during each migration period (it happens every other week for 3 months), we can protect a large proportion of the spawning activity to ensure survival of enough fish to support the fishery in the future. Fishermen can still fish the other days in order to maintain their production and profit while also ensuring that spawning is successful.